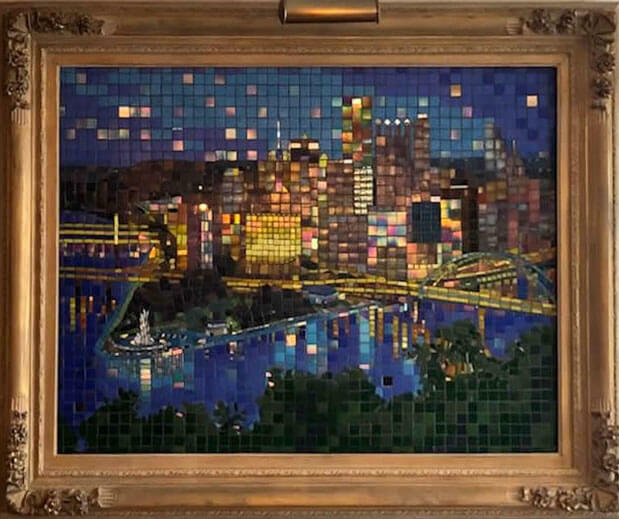 When I first saw this mosaic, my immediate reactions was “Van Gogh Pittsburg” because it has the same sense of nighttime atmosphere and light as Van Gogh’s painting Starry Night. That is quite an accomplishment seeing how Terry’s mosaic doesn’t even use the swirling andamento that is generally regarded as the defining characteristic of the famous painting. To appreciate what an accomplishment that is, search Google Images for “starry night variations parodies” and look at how each of these imitations rely on Van Gogh’s swirling brushstrokes. Terry used Van Gogh’s painting for inspiration and even managed to capture the essential “feel” of it (to my eye), but he still made his art original. 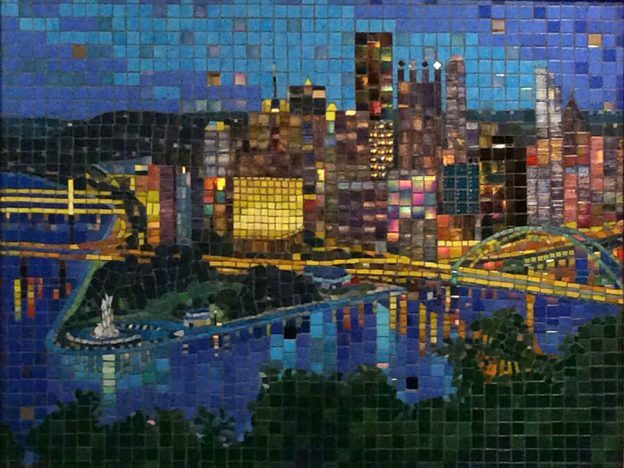 Pittsburgh Cityscape Mosaic by artist Terry Broderick with iridescent tile photographed in alternative lighting. To capture the feel of the lighting in a scene, especially in a landscape, is generally regarded as an accomplishment, even for a formally trained artist working in oil paint, with all the nuance and power that medium has to offer. Terry did it in tile. Not only that, but Terry’s tile is largely arranged in a grid, which is yet another constraint, one that usually detracts from natural rendering and a sense of verisimilitude. Also note how the size of the tile is relatively large compared to the level of detail being depicted. For me, that has always been a mark of mosaic skill, and I think most anyone who has ever cut up tile and tried arranging it to create an image would agree. And yet, look at the reflections on the water and the illuminated buildings and see how spot on they are as a whole. 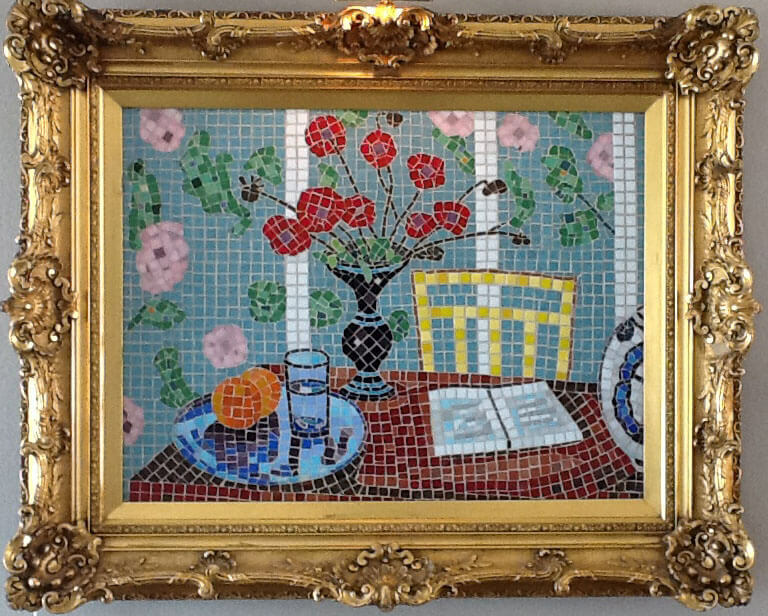 Matisse-inspired Still Life Mosaic by Terry Broderick. Terry also sent me some photos of his other mosaics, which include some tributes to Matisse, the great modern master and fauvist painter. Like Terry, I am in love with post-Impressionist painting and Fauvist painting and how this period gave birth to all the imaginative work that we take for granted today. I very much appreciate how Terry puts his modern fauvist mosaics in Rococo/Baroque frames, which I take as another reference to early 20th-century painting and how it was received and interpreted in context of what came before. Specifically I am thinking of Chagall’s ceiling of the Paris Opera House and how the entire Rococo building serves as one large gilt frame for the painted ceiling. 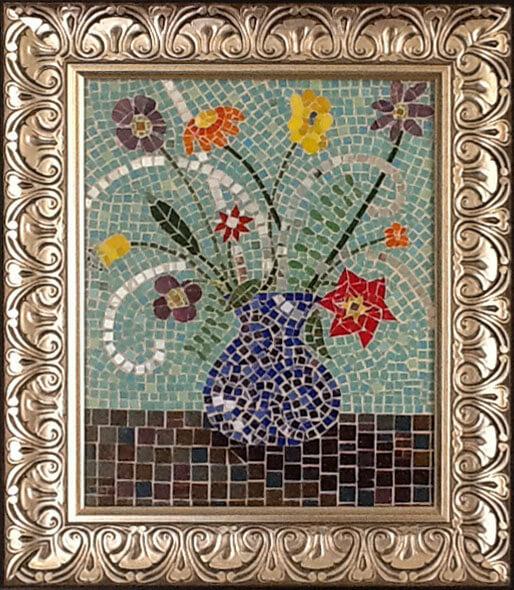 Matisse-inspired Floral Mosaic by Terry Broderick. Matisse-inspired Piano Mosaic by Terry Broderick. 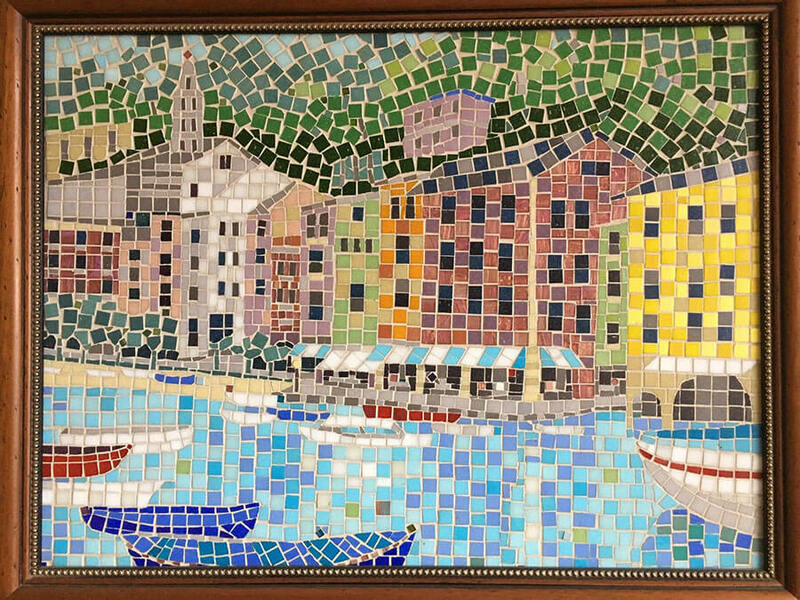 Portofino Mosaic by Terry Broderick. These pieces are absolutely fabulous. Thanks for sharing them with us, Joe and Terry! Amazing how you can create such depth, using mostly whole square tiles. I have found that one of the mistakes made by many of my beginning students is trying to cut tiles too small. But it takes real skill to capture a scene with larger tiles. You hit the nail on the head. I especially love the Pittsburgh cityscape. Thanks Jill for your comments ! Great city. Wish I got back there more. They just did a little write up on the piece and Joe’s review in Next Pittsburgh. Really beautiful work. I wonder if Terry Broderick has a website where we could see more his work? absolutely inspiring! these mosaics are fabulous, amazing the light and feel he has captured and with only square tiles! 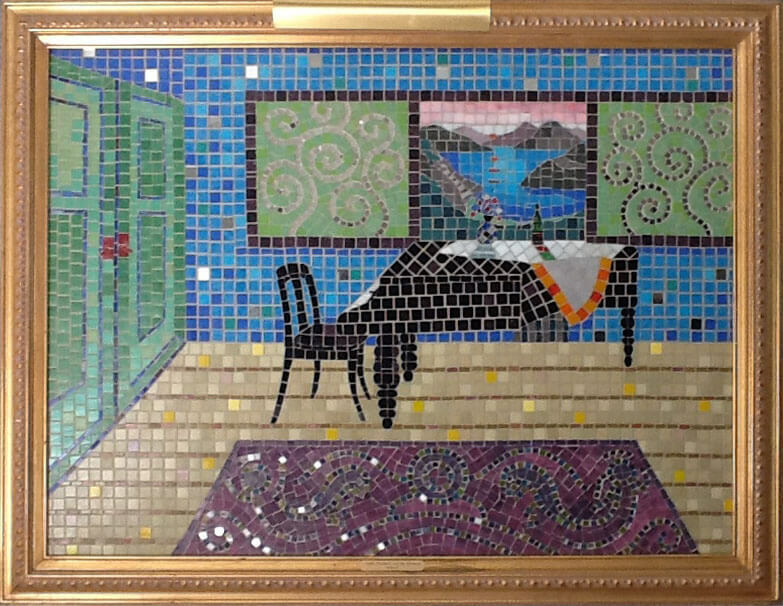 I enjoyed Terry’s mosaic works very much, Thanks for sharing Joe! I particularly like the cityscsape with the reflections. Thanks for sharing. The Pittsburgh piece is absolutely breathtaking! The ‘modern master’ series is delightful. Thank you, Joe, for sharing this. Does Terry have a web site? 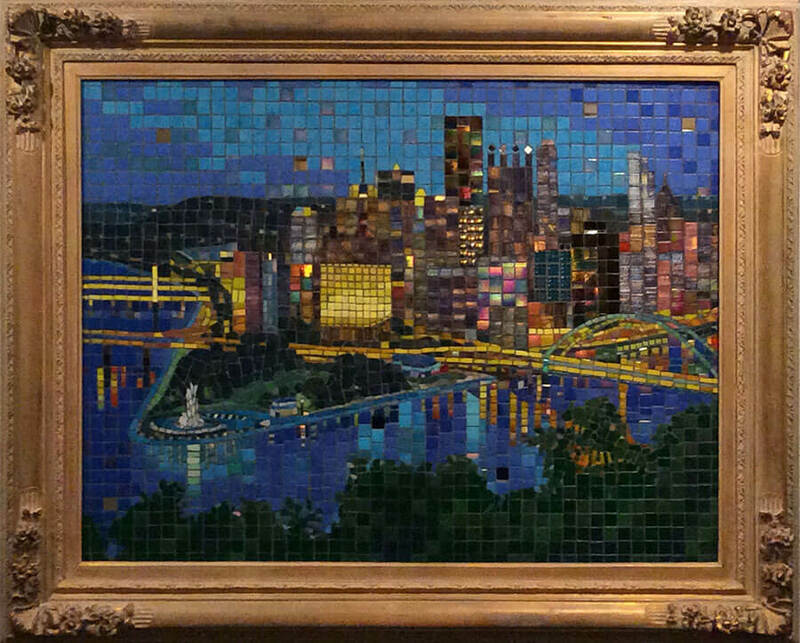 Terry Broderick, Your Pittsburgh Cityscape took my breath away first, then brought tears to my eyes. Thank you for sharing your beautiful creative spirit. Interesting, someone else I know had a similar reaction. These are some of the most gorgeous tile works I’ve ever seen. He might have used planer frames as he did with the last couple shown, as my eyes were continually torn from the beauty of the work by the ornamentation of the frames. Fantastic tiling! Thanks so much Bev ! The framing choice is a tough one. Someone else told me they thought the frame for Pittsburgh Cityscape was too plane. I’ll play around with them. Is the artwork on display anywhere?